This is the epilogue to the Hextech Revolution storyline. As with the previous updates, this is being posted in a rougher-than-usual form, because time is of the essence and I want to keep moving forward. I plan to come back and clean this up later. Thanks to everyone who helped to review this and offer suggestions as I banged it out! 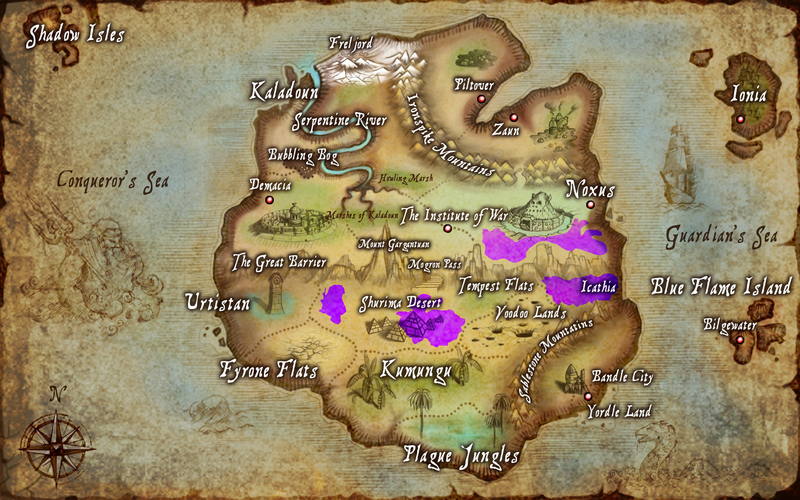 The spread of the Void from Icathia since the Void War. The so-called Hextech Revolution began with the discovery of a versatile and abundant new hextech energy source in Shurima: the Void-touched “dark sand”, or “pyrikhos”, created when Void energy from Icathia spread out and mixed with the mysterious enchantments that still lingered in the ruins of the once-mighty Shuriman civilization. Though the dark sand enabled wondrous and remarkable breakthroughs that truly revolutionized Valoran, it also brought great strife: the bombing of Piltover, the awakening of an undead horde that nearly destroyed Bandle City, and a brush with apocalypse that brought with it one of the most horrific battles that Valoran had seen since the Rune Wars. Merricurry’s groundbreaking theories described the framework for harnessing the power of the Void-touched “dark sand”, catalyzing the Hextech Revolution. Of the four factions that came before the League to fight for control over the dark sand — Piltover, Bandle City, Zaun, and Demacia — it was ultimately Zaun that prevailed. Zaun has begun to unravel the greatest mysteries of the cosmos, founded a new school of Void-touched psionic spellcraft, and built a mechanized techmaturgic army known as the HexKorps which (together with Noxus) defeated Demacia and its allies in the Battle of Shurima. It now controls the lion’s share of the pyrikhos in Shurima, and the League has vested Zaun’s techmaturgic academies and corporations with primary responsibility for regulating (or refraining from regulating) the use of dark sand throughout Valoran. No longer a minor associate of Noxus, Zaun has ascended to the status of world power. The walls of the jail cell were thick stone, deeply enchanted by the League’s most skillful geomancers. Hexproofed cold-iron bars secured the entrance. These bars were the cell’s principal vulnerability, as a dart or arrow could be fired through them. It was for this reason that Xin Zhao had positioned the table to give him clear sight of the cell’s barred entrance. His feet were planted, and his left hand rested on the far edge of the playing field, so that at a moment’s notice he could launch himself upright and bring the game-table forward to shield his king. It was good sturdy ironwood with a steel plate beneath the varnished surface. If an arrow or crossbow bolt did somehow pierce through, still Xin Zhao’s chest would be between the assassin and King Jarvan III, whom he had pledged to serve as chief seneschal for so long as he might live. He had resolved that such would be his destiny, and his fate: he would forever be Xin Zhao, guardian of the crown. Such would his life amount to, in the final counting. The King’s eyes were not on the board. He was looking to the hallway outside his cell, where stood nine guards at the strictest attention Xin Zhao had ever seen, even after so many years of service in a kingdom not known for laxity of etiquette. These particular jailguards were loyal Demacians all, and had volunteered to serve well beyond their usual hours of employment. The Ionian warden had granted their request. Zaun’s lawyers had been quite irate, but the Council had ruled that it saw no abuse of the warden’s discretion in permitting a particularly large number of guards to stand watch over the cell of a particularly important individual soon to stand trial facing particularly serious accusations. King Jarvan looked back down to the board, then moved his Northern Cleric across the River to his Eastern Bulwark. The ceramic figure’s heavy golden base thunked against the varnished wood. His aged fingers trembled as he slipped the top card from the Weather Deck and turned it over. Xin Zhao looked into the old man’s weary eyes. There had been kings, even Demacian kings, who came to relish war, and sought to blood-stain their names on history’s cloth. In the lonely hours of the night, he had reflected upon what he might do should he find himself bound by his oath to the service of such a tyrant-king, for it was a warrior’s duty to be resolved in advance. To fail to act in a crucial moment on account of one’s unprepared mind was a form of negligence, and for a warrior negligence was an extreme thing. Xin Zhao feared that one day he would be found negligent. One could make an oath not merely for one’s entire life but with one’s entire life, a commitment so profound that it came to contain the sum of one’s purpose and identity. One could at once make an oath and become that oath. Xin Zhao knew this because so he had done, when he was delivered from the arena and pledged his life to watching over the King of Demacia, whoever that might be. Whoever that might be. Death is inevitable; one can only avoid defeat. In the arena, Xin Zhao had come to see the truth, that at the end of every warrior’s journey comes a fight one cannot win. Or at least, a fight one cannot survive; in the proper semantics of The Measured Tread, one could speak of “victory” in death, but Xin Zhao had seen too many killings to ever be convinced that those last wretched moments did not signify defeat. No, he knew that one day he would face Death, and no matter how many other opponents he vanquished along the way, against Death he would lose. A true Demacian’s oath is a pact with Death. Most Demacians interpreted this proverb as simply an admonition to be willing to lay down one’s life to maintain one’s honor. But Xin Zhao found another meaning in those words. Every mortal, be they a warrior or a gardener, was slated to fight and lose a final duel with Death. Yet one who had made an oath such as his faced also a mortality of the spirit. For there was, for such a person, the possibility of a situation in which righteousness and justice would demand that one betray one’s oath, and in so doing destroy the entire content of one’s life. In this way, to make such an oath was to become mortal: to make a pact with Death. Though he felt a coward for it, he hoped that his duel with Death would come before he was forced to decide either to protect a madman while millions perished, or to betray his oath and drive a spear through the heart of the king he had sworn to protect. The King gazed down on the wisp of cloud painted upon the card’s face, forever drifting across a pale blue sky. “Summer Winds. Good for your Pegasus, I should imagine.” The old man did not have many summers left, and this one would soon end, with him inside a windowless stone cell. Xin Zhao considered the board, making his choice by instinct while his thoughts advanced further along their path. He wondered if the King himself had made such a defining oath, and thereby forever bound his purpose and identity to some greater cause: to Demacia, or to peace under the League, or to the rule of law. If so, did he fear the coming of such an impossible dilemma, where righteousness demanded one act and his oath another? Or had such a moment already come? In Shurima, he had violated the League’s most sacred law, breaking the peace with brutal force, risking the ruin of Demacia and its lasting dishonor. Before that, he had dispatched the royal navy to obliterate the great Noxian fleet en route to Shon-Xan. Those ships had carried soldiers intent on murder and destruction, yes, but carried also starving refugees, tens of thousands of them, intent on nothing more than survival. One could say that “every Noxian is a soldier”, but not with complete conviction, not while looking at hungry little children gazing across the water at a new land, wondering with wide young eyes if they might at last find something good to eat there. Fulfilling Demacia’s vow to Ionia, and its pledge to thwart the murderous schemes of Noxus, had meant breaking its vow that the downtrodden would always have cause to rejoice at the sight of the Demacian flag. For Ionia, the navy’s arrival had brought deliverance from a new Noxian invasion, from a new reign of slaughter and torment. But for those refugees, that flag had brought terror and death. Xin Zhao moved his Pegasus into the Glade, and collected two sapphire tokens from the King’s side of the board. “The Azure strategy does favor Pegasi, sire,” he replied with a small bow of his head. He considered the King’s lined visage, and wondered if he was looking at a broken man, a man who had betrayed his defining purpose and lost his self. One would think that such a loss would manifest plainly. But perhaps not: perhaps one could become a hollow thing with an unmarred outer facade. The heavy door leading into the hallway swung open and thunked against the stone. The warden nodded to the doorman and came to Jarvan’s cell. He bowed deeply, with the refined grace of an Ionian of good upbringing from an age now past. The warden bowed once more, and went to retrieve her. Xin Zhao rose from the game table. Therese Buvelle arrived wearing the same armor that had been taken from her and locked away all those years ago, when she had been captured defending the ancient Ionian city of Kurama during the first Noxian invasion and tried as an unlawful Demacian intervenor. She had not only rallied Ionia’s defenders and coordinated the strategy that kept Noxus at bay for precious weeks, but had fought hand-to-hand with the utmost valor on the city’s very walls. Even as the Ionians themselves began to lose hope, she fought on through exhaustion and gruesome injury: a true Demacian who refused to die so long as she stood between the cruel and the innocent. The League’s herald had arrived to announce the peace treaty, ordering all prisoners to be secured and their injuries seen to, just as she had been wrestled to the ground to look defiantly up at a black-steel axe blade. When the Noxians hauled her into the Institute and threw her down at the steps of the jail, she had been stripped of her armor, blood dripping from poorly bandaged wounds, bones broken, globs of Noxian spit running down her bloodlessly pale face, as wet as the ink on the flurry of treaty papers being signed in the Council hall. She would have died there in agony had Soraka herself not intervened. The glorious city of Kurama still stood because of her sacrifice, and the priests of its many temples had pledged to speak prayers on her behalf for so long as she lived. She wore no weapons, but there was no mistaking her warrior’s bearing. As one, the jailguards saluted one of Demacia’s greatest living heroes. Slowly, deliberately, she lowered herself to one knee and bowed her head. Xin Zhao suspected that this was a moment for which she had been preparing over all those years of captivity. But even if so, surely she had expected it to take place in a royal hall, not a jail. The King rose and approached the cell’s barred entrance. Xin Zhao followed by his side. “Rise, Dame Therese of House Buvelle, defender of Kurama, hero of the realm.” At his word, she stood. Even as the King spoke her praises, Xin Zhao studied her closely. She could have been an imposter, a Black Rose assassin. So long as she stood within striking distance of the King, that was all he could allow himself to consider. So his oath demanded. She bowed her head. His next question brought her eyes back to his face. The door swung open again, and Miss Sarah Fortune strode through. Her pistols were missing, and she carried instead a jail tumbler, the glass variety which could be superheated and purity-hexed to ensure the total absence of poisons and tinctures. It was full to the brim with a measure of water. Xin Zhao distantly admired the athletic precision of the Champion’s movements: though her impatient strut wobbled the water to the tumbler’s lip, subtle tilts of her wrist matched the oscillations so that not a drop was spilled on her way to the cell just to the right of Jarvan’s, into which Gangplank had been placed earlier this morning. Xin Zhao heard the indistinct murmuring of a man more than half asleep and still full drunk. Then he saw Miss Fortune sneer and jerk the tumbler forward. He heard a splash, followed by a startled gasp and a hacking, waterlogged cough. Gangplank coughed and harrumphed. He spat throatily; a slimy sound smacked against the stone floor. “I said SHUT UP!” Miss Fortune’s eyes flared. She hurled the glass against the flagstones with a Champion’s strength; it burst into motes too small to see. She seized the bars with both hands, as though wringing a neck. 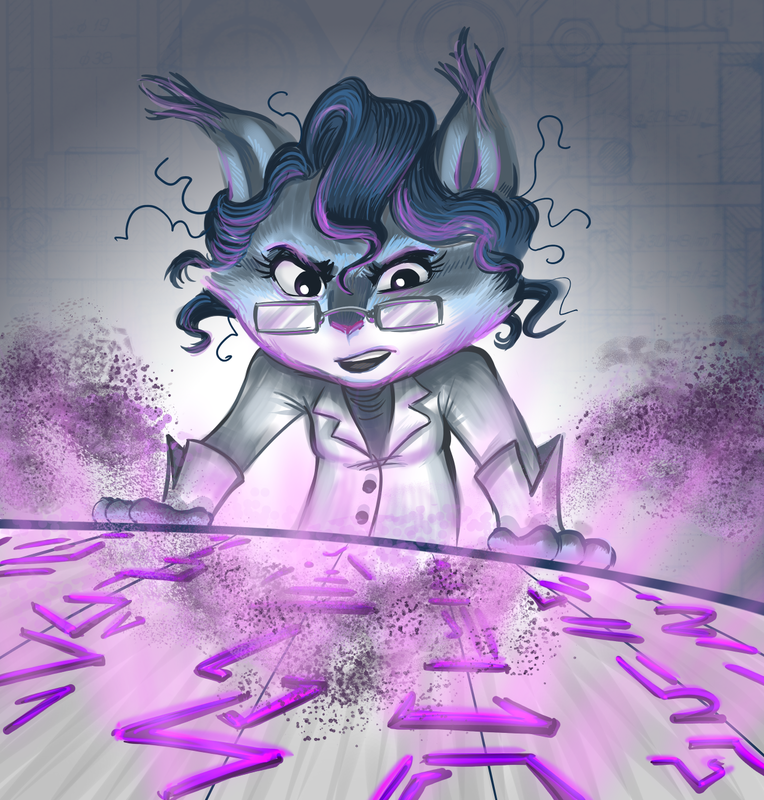 The cold iron hissed, as her anger brought little flecks of residual Summoning magic forth from her veins. The muscles in her bared arms flexed murderously as she twisted her grip back and forth. Xin Zhao was somewhat surprised not to hear the bars begin to bend. So much of her anger was directed into her fists that when she spoke next, her voice came out eerily soft, even sweet. There was a cold pause. The King stumbled back, and Xin Zhao moved to defend him from whatever horrors might come. The guards unsheathed their swords and turned to look down the hall. “Blade!” barked Therese Buvelle, throwing out her open hand. The guard beside her instantly rendered her his weapon, which she gripped and brought down into a half-crouched stance. A focused, defensive stance, one forged on the battlefield rather than in the practice halls. Down the corridor, the same voice that had chanted the eerie invocation began to scream incoherently. Miss Fortune settled back, resting one hand on her hip. “He’s safe in his cell,” she scoffed. Summoner Thomas Gnox. Yes. Xin Zhao recalled the panic and commotion, which had reached even into this jail, when his dark plot had been exposed. An Icathian bio-hex, enchanted into the great nexus of Summoner’s Rift. Had the scheme not been thwarted, it was said that it would have latched onto the minds of the next Summoners who came to the Rift, from there spreading through the aether from one Summoner to the next and to the next, incubating for days before erupting all at once with lethal effect. The mad Summoner’s palms slapped the stone of his cell. His voice broke into sobs. Just as calm returned, malevolent laughter echoed through the halls. Xin Zhao heard Malzahar speak from inside his own cell. Demacia won the final tournament of the arc, though Zaun beat it out on points. Demacia’s Summoners voted to use their tournament win to secure the release of Therese Buvelle, who will provide a military bonus. They also chose to lock down their (considerable) share of the pyrikhos, rather than either destroying it or freely sharing it with allies. On the top floor of Zaun’s famous Kommerzbank Building, Summoner-Chef Lu Bu was preparing a sumptuous luncheon for nineteen of the most powerful people in Zaun. He wore a crisp white chef’s uniform with a robelike foldover front that suggested the attire of his native Ionia. A purple pin on his collar, polished to a rich gloss and brightly edged in spell-worked silver, acknowledged his status as a Summoner of the League. “Yes, Chef.” She lifted the heavy pan a bit off the burner and adjusted the dial. Lu Bu was impressed by how easily she handled that much weight in one hand. “Yes, Chef!” they chorused. Earnest scrape-clatter sounds soon followed. He’d now spent almost a year living in Zaun, learning to appreciate its high-stakes hustle. He was making good money and picking up some innovative culinary technique, which was in itself almost worth all the late-night teleportation when he’d come back from an event only to find out that he was being called to the League for a match. Whatever happened to Summoners doing the summoning, anyway? But that wasn’t the main reason he was here. He was here because of Zac, and the academy Zac had founded for gifted individuals. He wasn’t formally enrolled — who knew how the world would react to news of a mutant Summoner — but he’d signed up for a cooking show, Mutant Cafeteria, set in their kitchen. The premise was hokey but popular: a rough-and-tumble band of Zaun’s outcast “freaks”, fresh off the streets of Zaun, learning fine cuisine under the stern eye of a world-class Ionian chef who rubbed shoulders with the great and powerful at the Institute of War. More importantly, it gave him ample opportunity to receive training from Zac and the rest of the faculty as to how to hone his abilities. Like, for example, his heightened hearing, which let him listen in on the conversation in the conference room next door, despite the hexproofed walls which would deflect and reveal any attempt to use traditional magic for that purpose. The sounds began to fade. He needed a rest. He took a breath and got back to cooking. He had no idea what they meant about the Frostguard, but maybe Zac could make some sense of it. He’d half expected to hear them planning out the invasion of Piltover. Good news so far. A sprinkle of dried sunberry root onto the cutting board completed the spell-circle. The deep green glow lightened a little, just right to mesh with the warm thaumic resonance he’d sensed from the truffles. He imbued his knife with a practiced gesture and a quick tap, then set about shaving off little slivers of deliciousness that sparkled with finely tuned magical energy. When he was done, you’d be able to sprinkle these on a heap of boiled shoe-leather and have a scrumptious meal. He glanced over at the simmering pan. The mundane colors and shapes blurred away as he looked into its ethereal shadow. Still not quite right. He flicked his wrist and struck the center of the pan with a flash of pyromancy that picked the flavor-notes right up. Good enough. He caught a strange look from the woman next to him, the one who didn’t seem keen on cooking poro. He glanced back and frowned. Something odd about her. She held the look a bit longer, then got back to work. As he spooned the rich sauce over the filets, he felt his mutant senses begin to return. He took a few deep breaths and reached out through the wall again. Little tingles of sound flourished into audible words. Lu Bu’s focus began to fade. Their man? In the Academy? The faces of the students started flicking through his mind. He forced himself to block it off and keep listening. There’d be time to think about it later. A shrill screech slashed through Lu Bu’s mind. He snapped back to where he was in the kitchen and felt his knees give out. He just barely managed to catch himself by slapping a palm onto the table. “You alright?” That woman again. The sous-chef who didn’t cook poro. What was her name? He gathered himself up. His mutant senses were absolutely shot. What was that? Something in the hexproofing? He didn’t really know how these powers worked, nobody did; maybe there was some way they could interact with null-fields, even if they weren’t exactly arcane themselves. “Here, I’ll show you,” she answered. He followed her to where the dessert was being prepared. This was going to be a highlight: a mousse made with psychic chocolate and a very subtle NoxiToxi infusion. Each bite was a trip through universal flavor-memory, reaching beyond space and time to bask in the most wondrous culinary moments that ever were or ever would be. In this particular case, he’d tuned the psionic resonance to the flavor-concept of chocolate, with just a few subconscious citrus allusions. It was careful work, and he was a little anxious that something would go wrong and one of these bigshots would end up with the combined experience of a thousand children tasting pickled beets for the first time. He took it from her, gave her a few moments of perplexed scrutiny, then popped it into his mouth. It tasted fine, but just like ordinary chocolate. A little spicy, but where was the psychic content? Oh, no. Oh, no no no no. Had it all gone inert? Had he botched the resonance field? If it had collapsed, the shockwave could have turned all the nearby enchantments poisonous, making everything in this kitchen unsafe for consumption. All this gourmet cuisine would have to go straight into hexproofed garbage bins. Maybe along with his culinary career! He desperately searched for something. Some psychic imprint. Maybe it’d just been transmuted somehow. He forced himself to go through the check list. Basic psycho-sensory theory. The resonance could have collapsed. That’s bad. That makes everything toxic. But it could also have been transmuted. The flavor dimension could be stripped out and replaced with other emotions, or maybe memories if you were really good. Nice to meet you. The rest of the chocolate is fine. You’re going to get a nasty stomach ache and you’re going to have to go back to your apartment. Someone else will have to handle the serving. And in ten seconds we’re both going to forget this conversation. Now hold on just one minute. Not a minute. Eight seconds now. Don’t fight it, Summoner. You want to forget this. Or else Dunderson’s PsiKorps detail will read you when you go through that door to give him his poro — and by the way, seriously? Poro? — and you’ll be in one of Singed’s labs getting carved up and thought-stripped before sundown, Institute pin or not. You know I’m not lying. Because Zac’s got friends even he doesn’t know about. Well, thanks. I guess. What’s your name, anyway? Olivia, not that you’ll remember. You’re pretty cute, by the way. Two seconds. Relax. He turned to reach for the bowl of cream to give it a few more whisks and a fresh invocation, but suddenly his stomach twisted up in knots. He stumbled back. “Ughh…” He tried to plant a hand on the counter, but his arms were jelly. He really should just leave. He was in no shape for this. He wanted nothing more than to throw up, down an arcano-tonic, and fall into bed. He steadied himself on his feet, and was soon drifting almost thoughtlessly to the door. Viktory for Zaun! Zaun now controls the majority of the pyrikhos in Shurima, providing ample fuel for its revolutionary new technologies. It also has the support of Merricurry, the leading luminary in the field. Zaun had three main policy choices: it could turn uncharacteristically benevolent (as Zac and Janna would desire), it could go “aggro” and ramp up its militarization (per Viktor and Singed), or it could simply return to “business as usual”. It chose the third option. It also had three options for further arcane research: it could use ancient Shuriman necromancy to create an undead Shuriman empire under its control, resurrect part of Shurima as the green paradise it once was, or tap into lost schools of elemental magic and convert some of its Void-tainted pyrikhos technology to use pure cosmic power instead. It chose the third option here, as well. Finally, given a choice of Freljordian factions to ally with, it decided to open discussions with the mysterious Frostguard. I do feel compelled to point out that Zaun not going Aggro has cost them the opportunity to have the HexKorps chanting this during this epilogue. Jayce turned from the crowd gathered in Brantley Station and gripped the heavy black curtain covering the memorial. For a moment, he lost his rhythm. He heard Viktor’s hollow, tinny laugh in the back of his mind. His grip tightened. He flung the curtain away, revealing a wall of portraits, all looking up, as though looking through the massive glass and steel skylight above. It was supposed to illuminate the station with sunlight. Not today. It was raining. Of course it was raining. Of course it was gray. He swallowed back the bile rising up his throat and turned to face the crowd once more. He looked over the crowd. He’d failed all these people on the Fields of Justice. But he’d saved them in Shurima. And when the Mayor had come to him asking for his help in militarizing Piltover, building an army to match Viktor’s HexKorps, what once would have been a difficult decision he suddenly found trivial. He would find a way. He’d have to make his designs more efficient; even with Demacia’s share of the pyrikhos, he’d have to stretch the supply. Viktor could afford to throw it around, knowing he’d always have more. Jayce would need to be smarter about it. He looked at the memorial wall and knew he’d be up to the challenge. The next time he met Viktor on the battlefield, he’d tear him and his techmaturgic abominations to pieces. He took a breath and addressed the crowd once more. Where was he. Oh, right. Recruitment. He walked over to fill the open space in the long line of recruiters, with their enlistment contracts laid out neatly in front of them. To bring a brighter tomorrow. That was supposed to be the closer. He looked out at the crowd and weighed the moment in his mind. A brighter tomorrow? Right now he was having a hard time thinking about a brighter tomorrow. Right now he was thinking about how much he wanted to see the HexKorps smashed into twisted scraps of metal. To feel the impact as he ended Viktor with one last swing of his hammer. To wipe Zaun from the face of the planet. He took a breath. He had a job to do. The lines formed quickly. He charmed and chatted, shaking hands and saying, “Welcome to the fight for the future,” more times than he could really stomach. Off to the side, cast members from The People of Tomorrow were signing autographs. Jayce played his own part, but his heart wasn’t in it. He found his thoughts wandering. Riven’s “Lost Legion” of Noxian refugees and wounded veterans. Piltover’s science had cured them, and after considerable debate the Mayor had granted them all permanent residency. Many of them had begun to settle down, but they’d also to a one pledged to fight for Piltover and defend their new home should it be required. Jayce didn’t trust Noxians. But he was starting to see their point of view. Strength had to come first, or you’d never live to see tomorrow. For the first time, he began to question his opposition to the Mayor’s tacit agreement with Riven, that Piltover would do its utmost to aid any future Reformist uprising in Noxus, up to and including the deployment of its military forces. They’d relied on Demacia too long. It was time for Piltover to stand up for itself. It was perhaps an hour into the recruitment drive that one of the Mayor’s aides came up to him and took him aside, to “discuss something.” She led him into a side office and closed the door, before taking a hextech sweeper out of her briefcase and scanning the room for bugs. And then she told him about the pyrikhos. Prince Jarvan had informed the Mayor that he would be placing the share of pyrikhos the Council had awarded to Demacia under guard, sequestering it. There was something about “limited access for authorized research purposes”, but it was being made very clear that Piltover would not be allowed to gather any meaningful quantity. And what exactly did Jarvan expect them to fuel these trains with? Or the airships? And did His Highness not realize that research requires the consumption of large quantities of pyrikhos? That research wasn’t just a matter of looking at it? The Mayor’s aide looked decidedly uneasy as she informed him that these concerns had been raised, and Jarvan had said that he was sure Piltover could figure something out. Jayce told her that she had better find someone else for the recruiting drive, because he had work to do. As he walked past the crowds, already the equations began to rework themselves in his head. Piltover was alone in this. Fine. He’d go it alone. Piltover was going to have to do it on a fraction of Zaun’s pyrikhos supply. Fine. He’d find a way. He was going to “figure something out.” And that something was going to be the last of his achievements that Viktor ever saw. Piltover’s Summoners voted to follow the “para bellum” path, setting the City of Progress on the task of building a hextech army to rival Zaun’s HexKorps. They also determined that, should another Reformist uprising occur in Noxus, Piltover will openly aid the rebels. Rumble gripped the last piece of the observatory in Tristy’s arms and pushed it into place. He walked the mech a few steps back along the moon’s surface and admired their work. He flicked the televox on. “All clear to pressurize,” he transmitted to the yordles in the moonbase’s atmospheric control room. He watched the valves running along the path open one by one. It was an impressive interlock system, large parts of it having been designed by Rumble himself. They’d begun using the same technology in the deep sea off the coast of Bandle City, to create a sanctuary for the Marai and (should they ever be found) the Atlanteans. Rumble leaned back in his seat and pierced the top of a juice pouch. He’d thought about what to say on this occasion. He was as pious as the next yordle, but somehow, exalting the Mothership didn’t feel right. “To Bandle City!” he proclaimed. He drank the toast, and it was quite possibly the sweetest juice he’d ever tasted. They hadn’t won out on the Fields. That day would come. But yordle ingenuity had refueled the Mothership and brought yordles to the stars — back to the stars, if certain theorists were to be believed. Rumble wasn’t certain, himself, but he liked the idea that his people had come from afar, from past glory to which they were now making their triumphant return. As he piloted Tristy back to the moonbase, he carefully rolled the emptied pouch in his paws, watching for any stray droplets that might escape. He and Tristy had saved Runeterra from the Void. It wasn’t entirely clear how the rift would have affected the moon, had it opened. But it was interesting to consider that, in a sense, yordles didn’t need Runeterra anymore. Or at least, they soon wouldn’t. He and Tristy … and Summoner Paddo, who had been invited to join the yordles in their celebration as the League’s emissary. Rumble was normally disinclined to work with non-yordle Summoners, though he’d learned to tolerate it. Paddo was perhaps a special case. He was no yordle, that was obvious. Some people caricatured Rumble as hating humans, which wasn’t really the case. What would that even mean? He simply recognized crucial differences, and a certain fundamental incompatibility between the two species’ modes of interaction and behavior. Paddo was, perhaps, a special case. He’d been one of the human graduates of Heimerdinger’s “Yordle Academy” — and how distasteful Rumble found that name for an institution located in Piltover — who had sailed over to visit Bandle City. Rumble had simply tried to have a reasonable, logical conversation with them, but their inherently violent nature had risen to the surface. Paddo was a novice Summoner back then, having put his Institute education on hold to enroll in Heimerdinger’s academy. He certainly had been a long way from induction into the Riotous Fists. But he’d known a little magic, and when he saw the other humans set upon Rumble so violently, he used it to hold them back and get Rumble to safety. They’d both taken a few nasty blows in the process. But when they next met at the Institute, and Paddo asked to study under Rumble as his first human apprentice, he found it surprisingly easy to say “yes”. He didn’t hate humans. It’s just that there weren’t many worth knowing. He walked Tristy into the airlock and waited as the pressure equalized, watching a gauge on his console. Runeterra was getting a lot more dangerous. Noxus and Zaun were out of control. After Zaun sent the HexKorps to attack Nefara’s undead army, some yordles had said that Zaun deserved their gratitude. The problem was, Rumble had said then, that you could be grateful to humans, but you couldn’t trust them like you could trust a yordle. He’d been shouted down, and they’d gone and signed that treaty. The way Rumble saw it, Zaun’s deployment of the HexKorps merely demonstrated their desire to show off their new weapons and intimidate Demacia, or perhaps to score some points with the League. He noticed that they’d tried to get a term in there about sharing control of the Mothership. Sharing the Mothership. He was not particularly superstitious, but the thought of Zaunites traveling in, even inspecting, the sacred Mothership bristled his fur. And then, of course, there’d been the rift in the mines. As far as he was concerned, that settled it. Zaun was out of control. It had to be stopped. But that was a job for another day. Pressurization complete. He powered Tristy down and disembarked, happily joining the throng inside. Several pouches of juice later, Rumble found himself out on the observation deck, pointing through the glass at Runeterra rotating below. He was standing on a crate, although it seemed to be wobbling an awful lot. That might have been him. He didn’t waste mental energy trying to work that one out. He pointed at the planet and looked back to address the crowd. “And, and so now, I guess you could say, that we’re all, I mean they’re all, looking up at us yordles.” He raised his seventh pouch of juice. “Let’s drink t’that!” He basked in their cheers and downed the entire pouch. Rumble looked over to see Summoner Paddo walking in, his grotesquely long arms bearing several trays of cupcakes. The others turned and scampered over to him, eagerly snatching the frosted confections up into their paws. Rumble scoffed. “Whatever. Beat ‘im all the time in toplane. S’was jus’ a bit bigger s’time.” He rubbed the side of his head with half-numb happiness. Rumble nodded. He found the gesture made his head bounce rather more than usual. He decided to sit down. And actually started thinking about lying down. That’d be nice. But first, his apprentice had asked him a question! He had to educate the benighted human as to the wonders of yordle science. Paddo took a bite out of a cupcake. Ha! Even had him eating yordle food. Rumble was proud. The Summoner wiped a bit of frosting from his mouth. From his enormous, enormous mouth. Rumble peered at him and noticed how weirdly smooth his face was. It was more distressing the more he thought about it. Rumble looked out at the planet again instead. He saw Paddo making some kind of gesture. He looked over and watched him trace something out in the air. Summoner magic. Maybe a clairvoyance spell of some kind. Maybe something fancier. Rumble peered at his apprentice. As far as he knew, he was the first Summoner up here. Something about League protocol. Those Riotous Fists types were always in secret meetings with the Council. Kinda sneaky. He’d asked Paddo about it, but even he was kind of dodgy when the topic came up. For whatever reason, they’d wanted Paddo up here before any other Summoner, even Bandle City’s own. Rumble was mulling this over when Paddo’s eyes shot wide. Violent streaks of orange and red spread like flames, consuming the placid blue glow. He started to scream. Rumble fell off his crate. He looked up and saw Paddo gripping his hair in his fists, as though he were about to tear it out. And then he fell back, to be caught by a bunch of yordles who were, Rumble reflected, probably just too drunk to move out of the way. But they lowered him slowly to the floor, and one of them scampered off to find a doctor. It took a whiff of Piltovian smelling salts and a curative chant to rouse the Summoner. He groaned as he started to sit up and, as far as Rumble could tell, immediately regretted his ambition. The Summoner lay back down on the floor. A medic slipped a nice comfy pillow beneath his huge, huge head. Rumble stared. He recognized the stodgy preamble to the Summoner’s oath. The pieces began to fall together. It was as though Paddo were whipping himself with every word, in pain but driven on by his anger. Paddo laughed: hollowly, contemptuously, hopelessly. He closed his eyes and lay back. Rumble had never seen him look so … defeated. Too late for what? Too late for what? Finally, he answered Rumble’s question. 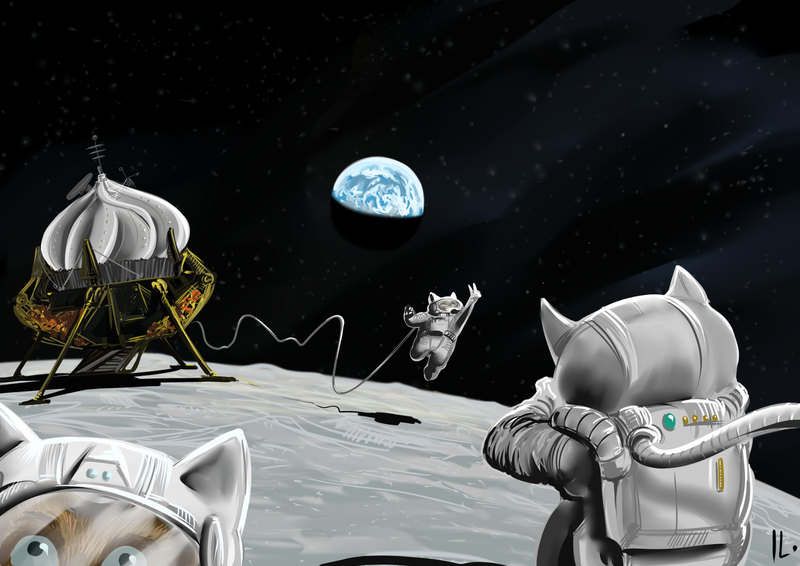 Bandle City refueled their glorious Mothership and landed on the moon. They had some rough times during the Hextech Revolution, but yordle history will never forget this crowning achievement. They’ve also begun to work more closely with the Marai, seeking a means to replace the fading Moonstone, and are deploying pyrikhos-fueled submarines to search for the lost Atlanteans. On the less cute and cuddly side, they’ve also resolved to oppose Noxus and Zaun at every turn. This concludes the Hextech Revolution storyline. The story continues with Part VI: Nyroth. Might want to give Demacia one of those italicized end-notes summarizing their end-of-arc state and choices. THEIR ACTIONS SPEAK FOR THEMSELVES, KNAVE. I mean, uh, forgot to copy that in. Why are Pilt and BC so desperate to eliminate Zaun? You’re becoming the war machine bent on destruction you feared us to be, while all we want to do is progress in our research. Kind of ironic in that way actually. He who fights monsters must take care, lest he also start hating Zaun for no good reason. uhm yeaa the lets destroy zaun was a bit too much for me too, but things like this happen when u fight against the appocalypse, and then u are the one shamelesly blamed. More seriously: Jayce is pretty jostled from the Battle of Shurima. He’s a little crazed right now. For example, that “wipe Zaun from the face of the planet” thought was a momentary flash of anger; he doesn’t really want to destroy Zaun. I don’t know about that. How do you even have a rebellion in Zaun? Who are you overthrowing? The Council? Someone would take Dunderson’s place, and besides, the Council is really just a representation of the real power. But Zac might well be trying to change things: bust some nasty megacorps, free mutants from labs, lead protests, whatever. I was arguing so much with my brother about how hard Zaun is to truly eliminate the leadership of. Think about it: if you eliminate one corporation, another one pops up in its place or takes over the role it had. The real ‘leaders’ are those with the most money, but competent scientists also have significant sway and ability to obtain money from the megacorps. Yeah, if Jayce is really rattled I kind of understand, but the fact that there are TWO factions that are trying to eliminate a rival is somewhat disturbing. We absolutely should have gone agro. The damage has already been done, the other factions are against us, and the only way to have made sure Zaun didn’t lose everything thanks to an overzealous backlash was to do everything in our power to maintain our military superiority. We chose the worst of both worlds approach; too aggressive for (ugh) ‘forgiveness’, too peaceful to be safe. First I’m writing the Nyroth Prologue, then we’re getting all that set up. Well, I suppose they do support a certain version of Noxus. Not entirely sure where that’s going to lead to though admittedly, since the storyline revolving around that would probably be more based around Riven than Piltover as a whole.